Welli is our LOVER! She is the tiniest husky and could pass as a large pomsky! She has no alpha in her at all and is willing to follow whoever is in charge. She is as sweet and willing as they come! 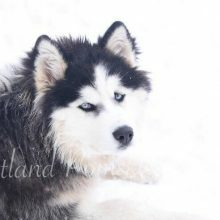 She has the beautiful blue eyes with expressive brows and markings. She loves spending her day playing with her sister Diva and digging in the mud! 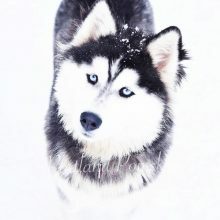 Diva is a Siberian husky with the amazing thick brows and capturing look! She is one of our smallest girls and her babies will all end up on the smaller end of the scale! 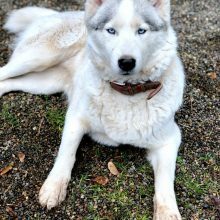 She is very submissive and is happy following around her pack leaders. She is always showing affection to the girls and loves her cuddle time with us! Katie is our love big cuddler! She has the sweetest disposition and super icy blue eyes! Her babies are always exactly like her! What we love about Katie is her face build-her thick short muzzle creates the cutest teddy bear babies that have a forever puppy look! Katie is always right by your side during group camp fires and is the social butterfly of the pack always welcoming everyone! 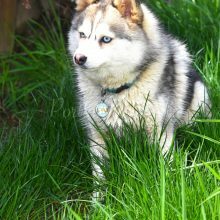 Pippa is a full Siberian husky but one of our tiniest girls! 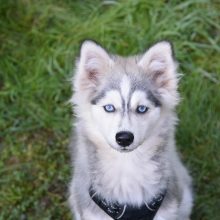 Her first litter of 50/50 Pomskies are all staying under 15lbs with perfect husky builds! If you are wanting a pomsky that stays smaller this is the girl for you! 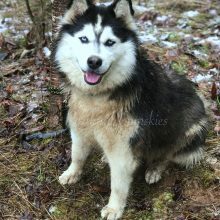 She has beautiful silver coloring with an amazing disposition that captures your heart! She loves to sit in your lap and give you kisses all day! She loves to go for walks and swims in the creek. 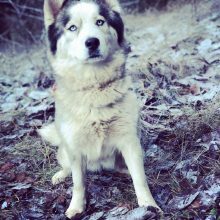 Kream is a 3rd generation Katara off spring (mom is Koko) and she encompasses all of the amazing qualities we want to have our babies inherit. She is over the top sweet, loves everyone, is VERY smart and active! She is happiest when exploring the yard and making friends with the pack. She also loves playing with the puppies. Her extremely sweet and caring nature make her a perfect mom for Pomskies. Koko is a special girl to us because she came from two of our own! 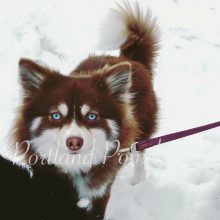 Koko’s mom, Katara is a huge favorite across the Portland Pomsky community not only for her amazing looks but her sweet disposition. Koko has both of these amazing qualities and is an AMAZING mom! She is happiest sitting in your lap all day which is so rare for a pomsky! She is the biggest cuddle bug and her babies definitely take this trait as well! 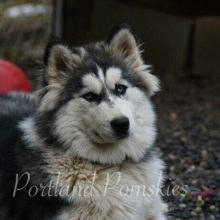 She is on the larger side for a pomsky at 30lbs but has had babies in all weight ranges! 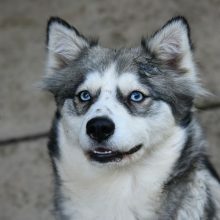 Katara is a grey 50/50 pomsky with a very wooly coat. She is still growing and maturing so there is not a final adult weight on her yet. 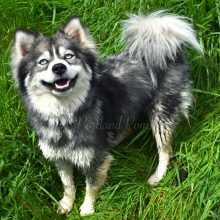 However, she has a thicker/heavier build than the other pomsky girls. She is the mellowest of the pomskies and is content laying next to anyone who is around! 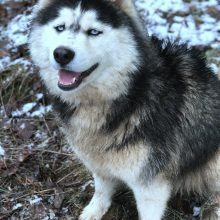 She is a half sister to Rue who share the same Siberian Husky mom. 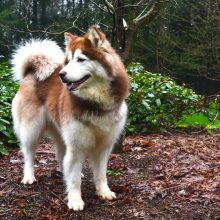 Katara is registered with the Pomsky Club of America and is a future mom to beautiful pomsky puppies out of both pomeranians and pomskies!